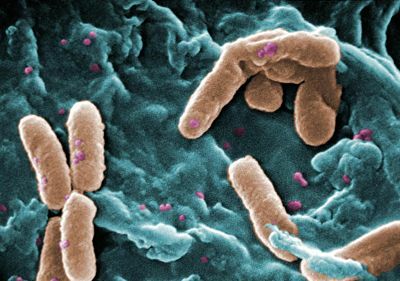 AUSTIN, Texas — Researchers studying a dangerous type of bacteria have discovered that the bacteria have the ability to block both their own growth and the growth of their antibiotic-resistant mutants. The discovery might lead to better ways to fight a class of bacteria that have contributed to a growing public health crisis by becoming increasingly resistant to antibiotic treatments. "This means we can start to think about the population of microbes as another set of knobs you could turn to fight infection," says Vernita Gordon, an assistant professor of physics at The University of Texas at Austin and author of the paper published May 12 in the journal Interface. The bacteria in this study, Pseudomonas aeruginosa, frequently cause pneumonia in hospital patients and life-threatening infections for cystic fibrosis patients and people with HIV and chronic wounds. It is part of a class of pathogenic bacteria that are becoming increasingly antibiotic-resistant and that includes E. coli, a leading cause of urinary tract infections, and N. gonorrhoeae, which causes gonorrhea. The researchers found that these bacteria produce a byproduct that can change the pH balance in ways that help suppress the antibiotic-resistant bacteria among them. The finding supports the notion of adding a base (a substance with higher pH) to certain inhaled treatments that can be given along with antibiotics, for example in cystic fibrosis patients. This would help tamp down antibiotic resistance, while allowing doctors to lower the dosage of antibiotics that are toxic at high doses and that produce nasty side effects such as deafness and kidney damage. "Her results suggest that, for certain types of infections, formulation of an antibiotic that creates an alkaline environment at the source of infection could be effective," says associate professor Bryan Davies with the university's Center for Infectious Disease, who was not involved with the study. Gordon's co-authors are Karishma Kaushik, a graduate student; Nalin Ratnayeke, an undergraduate and Dean's Honor Graduate; and Parag Katira, a former postdoctoral researcher in Gordon's lab. This research was supported by ExxonMobil, The University of Texas at Austin and the university's Department of Physics. For more information, contact: Marc Airhart, College of Natural Sciences, 512-232-1066.